In the absence of the hundreds of thousands of western sandpipers that Rob Butler and I have come to see, only our deep, water-filled footprints in the mud of Delta’s Brunswick Point foreshore reveal our effort to witness something extraordinary. Behind us on this late April afternoon is a shoreline Pick-up-Sticks of driftwood, salt-weed hummocks and boot-sucking intertidal runnels that mark the Fraser estuary’s vast mudflats. Each year millions of shorebirds pause here on their annual transits along the globe-spanning Western Flyway between South America and the Arctic. The Fraser Delta, Butler says, is the best place in North America to witness the arrival of 800,000 migratory western sandpipers and their dunlin cousins. Their airborne flocks normally fill the sky with massive murmurations of birds. These kaleidoscopic, endlessly transforming displays of aerial liquidity are one of the most spectacular things in all of nature. But today: nothing. And so Butler, a noted ornithologist, author and painter of birds, creates a rhetorical murmuration of sandpipers. It was 1989, he says, when he stood where we are now. “There was just a mass of birds. Feeding on the mudflats here.” And he points to the silvery-green sheen of exposed, slime-covered mud that stretches birdless from where we stand westward three kilometres toward the Strait of Georgia. “They must have seen a predator. They all took off! These tiny, tiny birds. All around me. 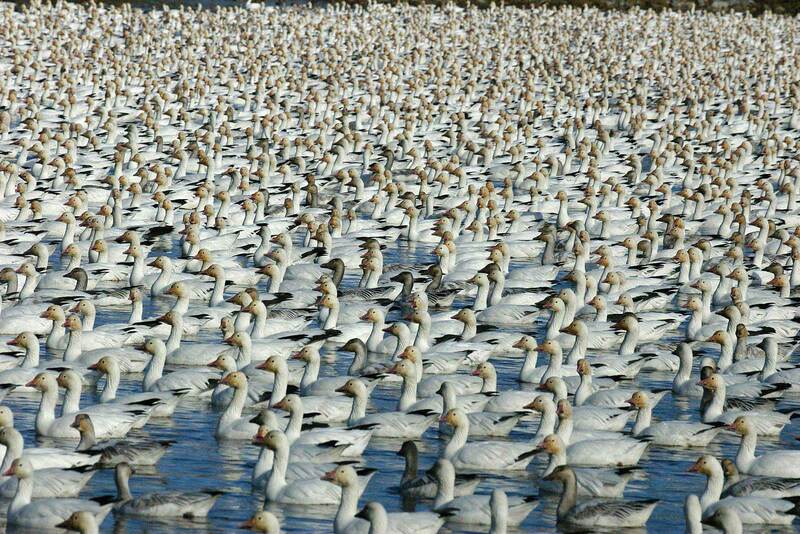 A hundred thousand birds! Flying right over my head. It was like a jet engine going by: WHHHRRRR!” And he gesticulates madly, trying to recapture two-handed the whirlwind in the air. Each year, huge flocks of western sandpipers visit the Fraser estuary to refuel before continuing their journey north. Credit: Tom Middleton. But imagining is not seeing. So we wait. The tide gradually creeps in. In hip waders, I feel myself slowly sinking deeper into the mud. There’s only the constant rumble of moving trains and cranes from Port Metro Vancouver’s huge loading terminal just offshore. Then, suddenly, off to the right there’s an explosion of white as if a confetti-bomb has gone off. And 5,000 snow geese rise from the Brunswick Point salt-grass amid a cacophony of honking as—Butler confirms with a quick scan of his binoculars—a low-flying harrier hawk appears. The geese pass overhead, wings drumming, and bank inland toward Delta farmland. We’re left waiting for the sandpipers that do not come. Disappointed, we slowly extract our boots from the mud and retreat like two lurching escapees from the famous Monty Python “Minister of Silly Walks” skit to sit on some shoreline logs and reflect on the Western Flyway’s shorebird migrations. And as well, to reflect on the increasing dangers migratory birds face under the multiple impacts of estuary industrial development, port expansions and rising sea-levels. In North America, for example, there’s been a 70 percent loss in the continent’s total shorebird populations since 1973. On the Pacific coast of Asia, the statistics are even worse. 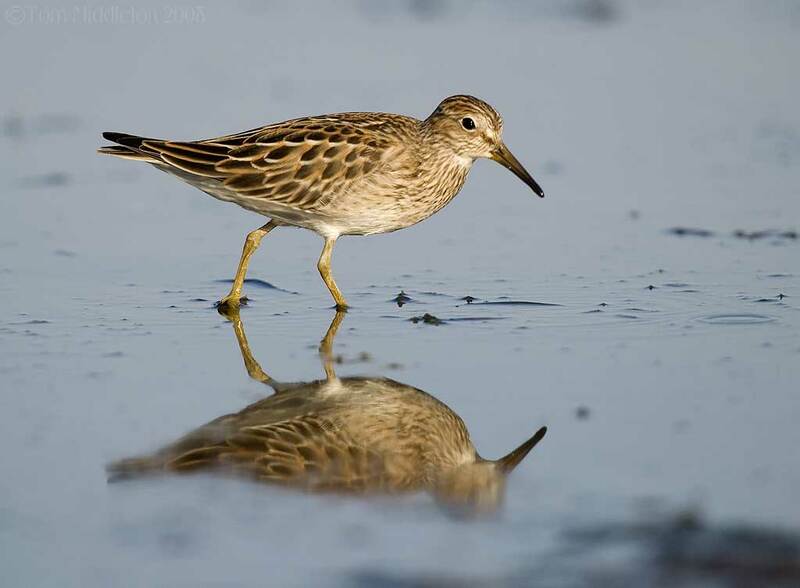 In the early spring of each year, Butler explains, four million western sandpipers and dunlin leave their habitat in Latin America on their 12,000-kilometre flights north. Those that utilize the coast-hugging Western Flyway return each year to the same section of the same mudflats that they’ve used for millennia. But on their arrival at Brunswick Point, the birds confront an immense problem. Of the 27,000 kilometres of BC coastline, less than one percent is mudflats. 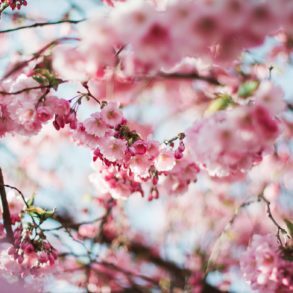 And it isonly there that the organic, surface-covering slime— called by its scientific name “biofilm”— blooms under a warm late-April sun. This natural phenomenon provides the slime-slurping birds with the essential energy needed for their onward flight 900 kilometres north to the next mudflats at the Stikine River estuary. 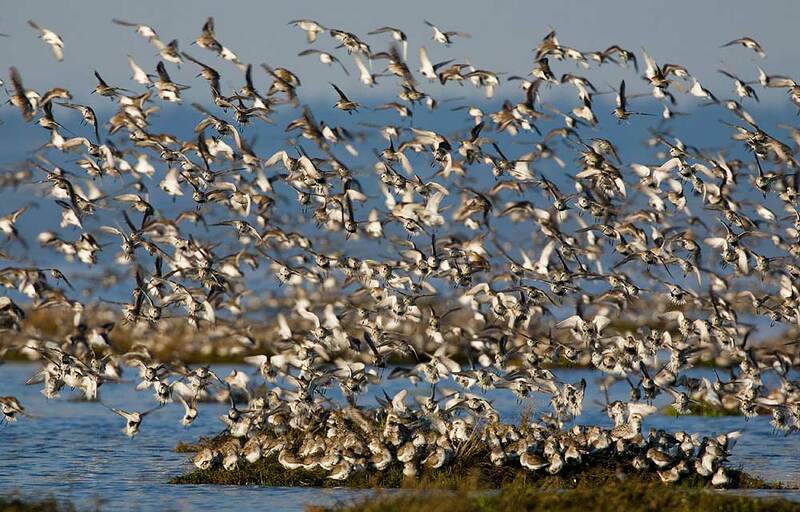 “This is a critical stepping stone—the most important place—for the sandpipers to stop on their entire migration,” says Butler, looking out across the Fraser estuary mudflats. He’s well aware that Port Metro Vancouver plans to build the gigantic new $3 billion Terminal 2 shipping island—dumping a million tonnes of rock into the ocean—directly offshore from where we sit. 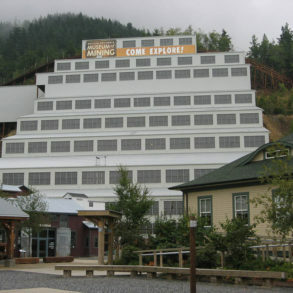 The proposed expansion to Roberts Bank Terminal. Photo courtesy of the Government of Canada. Ever since she was a child in England, Anne Murray has been deeply involved with birds and nature. And from her Tsawwassen home she has, for the past 27 years, explored and written about the natural history of the Fraser River Delta that stretches from Iona Island in the north to Boundary Bay in the south. 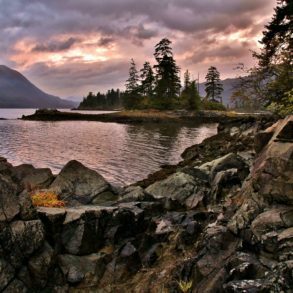 Often overlooked by environmentalists justifiably concerned with oil pipelines, old-growth logging and fisheries, the estuary’s ecosystem, she believes, is threatened by what has happened there, and what might happen next. Seventy percent of the delta’s marshland that once served to protect outbound juvenile salmon and inbound migrating ducks and geese is gone: dyked, buried and built on over the past century. The populations of the Fraser River’s five types of salmon are, in fact, massively diminished from a century ago. This is especially true of the chinook, whose population has collapsed in recent years. 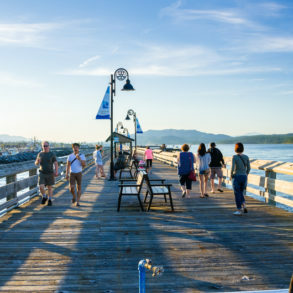 (The Richmond district of Steveston was known as “Salmonopolis” during its early days.) As the number of salmon drops, so goes the population of BC’s chinook-eating southern resident killer whales. Today numbering 78—half the population of a few decades ago—the orcas are now officially deemed endangered. A light rain-shower begins and bird books are tucked away, ending Murray’s avian soliloquy. And nowhere more so in North America, he says, than the Fraser estuary. At 21,703 hectares, it’s the largest estuary on the Pacific coast of North America and the most important estuary in Canada. It sustains over 300 avian species. And over 1.4 million migratory shorebirds which fuel up at the mouth of the Fraser on their incredible twice-yearly transits of half the planet. But like the others fascinated with birds, Cannings feels compelled to issue this warning about the Fraser estuary: “It’s a perfect storm of political conflicts. We’ve dyked the Fraser Delta. We’ve buried the birds’ marshlands. We’ve made it a great place for agriculture. A great place for building port facilities and loading ships. A great place for millions of homes and cars. A great place for industries… and their soup of chemical wastes. It’s easy to live on deltas. But not if you’re a bird today. ”In fact, worldwide: 18 percent of all birds (almost 2,000 different species) are listed as highly or near-threatened with extinction. To fully understand the miraculousness of the sandpipers’ migration, consider these things: Each bird is tiny, smaller than one’s fist and the weight of an ordinary kitchen egg. And yet: they leave their Panama/Colombia wintering grounds in early April and, in a series of a dozen or so nonstop 1,000-kilometre flights, arrive at BC’s Brunswick Point by month’s end. And their breeding grounds in Alaska a few days later. Their precise movements are known because people like Butler and San Francisco avian ecologist John Takekawa have super-glued hundreds of miniature, one-gram transmitters to the migrating sandpipers’ backs (they fall off after a month). This allows the scientists to track via telemetry individual birds over the entire route. The northbound birds leave each of their mudflat feeding grounds in the late afternoon, re-energized from a day or two of slurping slime. And fly onward through the night in huge, twittering flocks of 20,000 to 50,000. Mysteriously, their passage is somehow timed to synchronize with the brief springtime blooming of microscopic, plant-like creatures called diatoms. Embedded in the mudflat biofilm, numbering in the trillions, and orange with energy-producing beta-carotene, these diatoms are the fuel—the steroids, so to speak—of sandpiper migration. By the time the sandpipers have completed each segment of their 12,000-kilometre migration however, they’ve expended their diatom-derived energy. They’re exhausted and hungry. Takekawa compares these stopping-places to beads on a necklace. Butler, to a string of well-spaced airports. If, at any one site, the “bead” is removed or the “airport” destroyed, the sandpipers face starvation. This is, in fact, what has happened to tens of millions of migratory birds in recent years on the East Asian-Australasian Flyway where 40 major estuaries, mostly in China, have been destroyed for industrial and port purposes. As Butler and I walk the Brunswick Point dyke back to our cars, we both see—far to the west—several small murmurations of sandpipers moving over the mudflats, now covered by the incoming tide. From that distance, the flocks are the size of a thumb held out at arms-length before one’s eyes. Butler has no idea why they haven’t landed to feed. The thousands of low-flying birds transform themselves like grey, elongated, ever- expanding-and-contracting thought- balloons, turning grey-black when two airborne flocks overlap, going invisible when they simultaneously bank, exposing their cloud-white bellies against a cloudy sky. They’re almost ephemeral then, like a will-o‘-the-wisp or an itinerant daydream, soon to disappear. A Canadian wildlife scientist reported in late 2017 that the total number of western sandpipers passing through Brunswick Point was down by two-thirds last year, the lowest bird-count since record-keeping began. About 350,000 sandpipers have gone missing. No one knows why. But there are plenty of suspects. This article was featured in BC Mag's Spring 2018 issue. 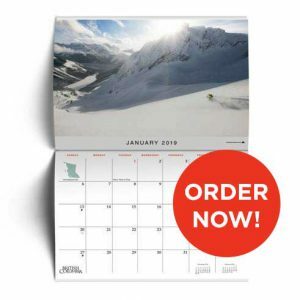 Order it from our Shopify store now (while supplies last) or subscribe to our Digital or Print & Digital editions to gain access to the archives going far back as Summer 2015! Vancouver’s Daniel Wood is one of Canada’s best-known magazine writers and the winner of 34 regional, national, or international writing awards. He’s also the author of 14 books. His stories often deal with conflicts around social justice, environmental abuse, urban politics, and the outsider’s role in a doctrinaire world. As an international journalist, he has traveled to over 100 countries and is a member of the prestigious Explorers Club.